Simply click on the ‘My Account’ on the left hand side menu – then click “I don’t have an account” and follow the prompts to create your account. If you prefer to create an account on our website (e.g. 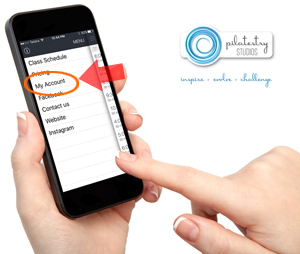 if you don’t have a smartphone or don’t want to download our mobile app), you can create an account on the Pilatestry Studios website: head to the ‘Schedule your Class’ page. From there, click on ‘My Account‘ on the top right hand side and proceed to create your account. The best way to do this is to download the free Pilatestry Studios mobile app. Select the class you would like to join, and tap to sign up. If you are not yet logged in you will be prompted to do so. If you prefer to schedule a class on the website (e.g. if you don’t have a smartphone or don’t want to download our mobile app), no problem. Head to the ‘Schedule your Class’ page. There you can search for your preferred Pilatestry class – click on the green REGISTER button to sign up for that class. If you are not already signed in to your account, you will then be prompted to log in. How do I view your class prices? The best way to do this is to download the free Pilatestry Studios mobile app. Once you have loaded the app, simply tap the main menu (swipe to the right), tap on “Pricing” and see a full list of prices. You can tap to select your preferred packages and purchase them from within the app. How do I activate my Groupon discount? If it’s your first class with us, you’ll need to create an account first. To create your account, use the mobile app (as instructed above in the first FAQ); or, head over to the Class Schedule, locate & click the ‘Sign up’ tab, and continue to create on online account. With your account created, you can email us at office@pilatestrystudios.com.au with your name, security and voucher codes – we will activate your Groupon and you can enjoy your Pilates classes with Groupon applied. Wear comfortable clothes that you can move in, a little form fitting so our Instructors can assist with your form. Loose clothing may hinder some movement. How Do I Purchase Class Packages? Simply click on the ‘Pricing’ on the left hand side menu – a range of service packages will be displayed. You can purchase these right in the app. If you prefer not to use the app, or want to buy online now via our website, head to the ‘Class Prices’ page which is located as a dropdown item under “Classes” one the main menu. You can then buy securely online ‘on the Mind Body Website‘. Note: You will need an account on Mind Body to do this. You can place yourself on our waitlist. In the event you have been moved from the waitlist to the class you will be sent a confirmation email. Please make sure you have opted-in to receive our email notifications and reminders. We are located on the corner of Penshurst and Victoria Ave. (Above ‘Taste Living’). Level 1, 341/343 Penshurst Street Willoughby NSW. Our entrance is on Victoria Ave. Parking can be found at the rear of our building (behind ‘Taste Living’), or surrounding street parking. Can I transfer my classes to someone else? All classes at Pilatestry Studios are non-transferable. Classes cannot be shared between family and friends. You must be a minimum of 16 years of age in order to attend Pilates Class at Pilatestry Studios. Consent: If you are under the age of 18 we require a signature from your parent or guardian. Yes! Pilates is a safe and affective way to keep you and your baby happy and healthy throughout your pregnancy. Pilates is a safe and effective way to keep you and your baby happy and healthy throughout your pregnancy. We want to bring out the best for you, your baby and your body throughout your pregnancy. Have a look at our policies or ask our friendly instructors regarding the best class for you to attend. If you have never tried a reformer Pilates class before, we recommend that you schedule into our INSPIRE class which will give you the fundamentals of Pilates. Our EVOLVE class is for those that have taken at least 5 INSPIRE classes and are ready for growth within their Pilates practise. Next you may take the CHALLENGE. The ‘Challenge’ class is designed for those who are ready to EVOLVE to the next level of their Pilates practise. Our Cardio Xpress and Barre Xpress are for all levels of endurance. The best way to do sign up for any of the above is to download the free Pilatestry Studios mobile app. Once it’s loaded, you’ll see a full list of available classes. You can tap to select your preferred class and sign up from within the app. Our friendly administration staff will will attend to all e-mails Monday-Friday 8am-3pm. The studio will be closed during the Christmas period. Closing on Monday 23rd December 2019 – Re-opening Monday 6th Jan 2020. All closures and limited schedule dates listed above will be reflected in our Pilatestry Studio App booking system. Please ensure to take these dates into consideration for any packages or contracts you many hold or purchase as they will not be extended or paused. All terms and conditions apply.